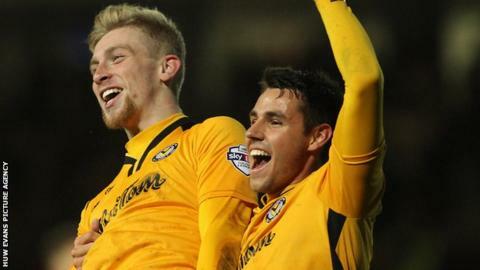 Swansea City have recalled striker Oliver McBurnie from his loan at Newport County. McBurnie, 19, joined League Two side County in November and scored a hat-trick on his debut against Luton. The Scottish youth international made two other appearances for Newport. He had initially signed on loan until January but, following his recall, McBurnie will be available for Swansea's Boxing Day Premier League game against West Brom. McBurnie has yet to make a senior appearance for the Swans, who he joined from Bradford in July. The Welsh club are currently in the Premier League relegation zone having won only one of their last 13 league matches. Swansea have scored just 15 goals in their 17 Premier League fixtures this season, with Aston Villa and Stoke (both 14) the only teams to have scored fewer. Last season's top-scorer Bafetimbi Gomis has scored five goals this season but has found the net only once since August. His main competitor for a starting spot, Portuguese striker Eder, is currently injured.